The kilometers-thick ice of the Antarctic holds many secrets. For decades, scientists have made use of ice-core drilling to research the history of the global climate. Among these scientists is a team from the British Antarctic Survey (BAS). With a new technology, the researchers can drill into the ice eight times faster. The British organisation has five research stations in the Antarctic, five aircraft, two research ships and a multitude of scientists who do research in the perpetual ice. BAS is the world leading centre for polar research and expertise, addressing issues of global importance. The «Ice Dynamics and Palaeoclimate» team developed a new technology (RAID=Rapid Access Isotope Drill) for ice-core drilling. A technology which makes it possible to penetrate much quicker in to the ice. Conventional ice-core drilling takes a long time. The 3.4 kilometer deep hole at Dome Concordia in the eastern Antarctic, took for example, 5 years to complete. 800,000 year old ice was retrieved; until now the deepest insight into the history of the Earth’s atmosphere. However, sometimes ice-cores from such deep holes do not produce good results, i.e. if the ice-core has been taken from the wrong place, explained Julius Rix, Ice Core Drilling Engineer at BAS. 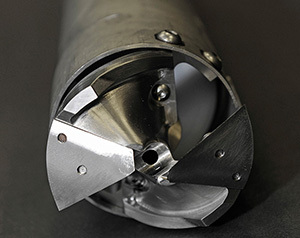 According to Robert Mulvaney, Scientific Leader of the Research Team, before drilling a deep ice-core, it will be possible to drill several small cores of approx. 600 meters depth, with the new technology, and bring them to the surface for analysis. Drilling to this depth takes about 7 days, with conventional drilling 2 months. The thickness of the ice and the geothermal heat indicate if it is worth drilling deeper. “It’s all very exciting as nobody before has tried to drill holes in the ice of the Antarctic so quickly” declared Mulvaney enthusiastically.